If you’re looking for a family-friendly musical, you’d be hard-pressed to find one more accessible than “Annie”. An adaptation of the comic strip, “Lil Orphan Annie”, the musical is the story of the 11-year-old girl who finds her way into the home (and the heart) of the billionaire Oliver Warbucks. The show opens in 1933, during the Great Depression, in the orphanage where Annie and her friends live under the “care” of the sadistic Miss Hannigan. Annie sings her bedmate to sleep with the sweet ballad “Maybe”, as she daydreams about the parents who left her behind with only half a locket and a note to remind her they loved her. Having been abandoned 11 years before, Annie imagines how wonderful her parents and her life could be–if only she weren’t trapped in anonymous squalor. She and her fellow orphans then burst out into one of the most well-known songs from the musical, “It’s the Hard-Knock Life”, describing the roughness of their institutionalized upbringing at the end of Miss Hannigan’s ruler slaps. As the show continues, Annie does eventually break out–but her freedom is short-lived, and she returns to Miss Hannigan’s control just in time to be spotted by Warbucks’ secretary–who’s on the lookout for an orphan to join the billionaire for the Christmas holidays. And though the taciturn Warbucks didn’t intend on a girl orphan, he warms quickly to the plucky youth and even gets to the point of offering to adopt her. Annie has other plans in mind, though, as she’s still holding out hope that her parents will return for her one day, prompting Warbucks to offer a giant reward to entice her parents to come forward. Miss Hannigan’s crooked brother, Rooster, and his gold-digging girlfriend step forward to pose as Annie’s parents to get at the booty. Of course, hijinx then ensue. “Annie” is well-known for a host of high-pitched, kid-driven tunes–particularly “It’s the Hard Knock Life” and “Tomorrow”, both of which are amiably performed by the touring cast. (I saw the tour in Boston, at the Boch Center Wang Theatre.) And in general, all of the songs are performed well from a technical standpoint. The kids are predictably adorable, and various members of the cast provide the requisite amount of hamming it up needed to earn laughs. One area where the show has some room for improvement is in its pacing. The songs feel rushed–in some cases to the point where the spoken dialogue feels like something the cast has to get through as fast as possible so they can speed-sing the rest of the script. The time between songs should contribute to the energy, but at points it feels like the cast is so pressed for time that the ability to demonstrate the emotional depth of their roles is diminished. Erin Fish’s Miss Hannigan is awfully cranky, but she doesn’t come across as particularly committed to the meanness sung about her character, one of several characters who come across as thin and one-dimensional. Gilgamesh Taggett’s Warbucks, in particular, seemed abnormally stiff when delivering most of his dialogue, but he lit up for the songs. Even so, the songs and music are still as infectious as ever (and I’m sure there were at least a couple of kids in the audience who were inspired to ask later what a “Hooverville” was). The set design was really fantastic–with beautiful detailing and a slick modular design that made the set transitions fairly seamless. And particular moments have stand-out levels of hamminess (be on the lookout for Timothy Allen’s vivacious Harold Ickes) and Bunny Baldwin’s max-adorbs Molly. As one would hope for the show’s lead, Angelina Carballo’s “Annie” was a bundle of energy, and she shone like the top of the Chrysler Building. Or maybe that was just the light from the smiles of the kids walking out clutching their “Annie” dolls and singing the songs. 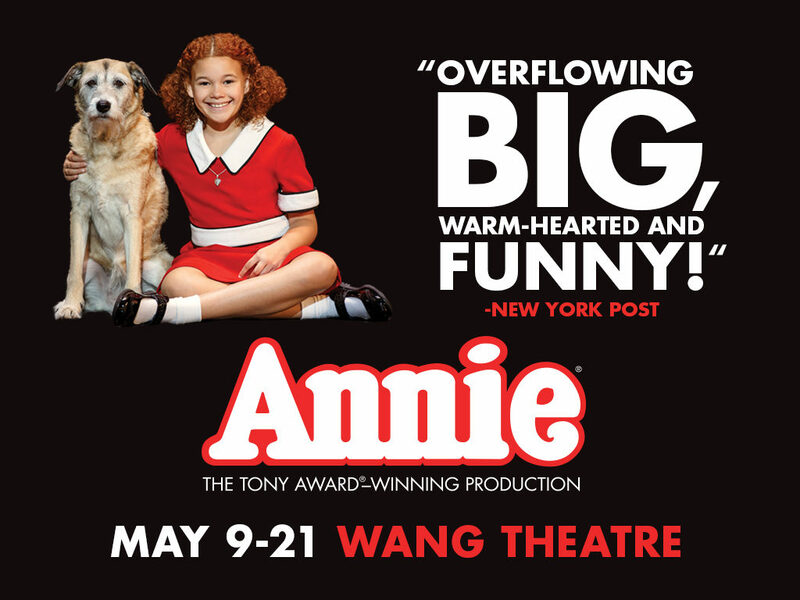 “Annie” is playing at the Boch Center Wang Theatre through May 21, 2017. Tickets are available via the tour’s website and the Boch Center’s website.